When Is A Silver Dollar Worth $2.3 Million? Last week, an 1804 Adams-Carter Silver dollar sold at auction for a whopping $2.3 million. That’s a pretty good amount for 1 ounce of silver worth about $12! There are only 15 such coins known to exist and they’re quite popular. The buyer was New Jersey dealer John Albanese, who said that the price was “basically a half-million down from last year because of the recession. It was a good opportunity. These don’t come around all the time.” The coin, the finest Class III 1804 dollar outside museums and available to collectors, had been expected to fetch $2 million. 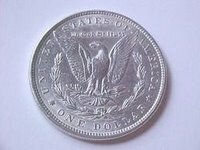 The varieties of 1804 silver dollars are known as Class I, Class II, and Class III. The Class I pieces are sometimes called Originals, although that name is inaccurate, since they were struck in 1834 rather than 1804. The Class II and Class III pieces are sometimes called Restrikes, also an inaccurate name since there were technically no Originals. A single obverse die and two reverse dies were created for all of the 1804 dollars, and it is virtually certain that the dies were all made at the same time, certainly no later than 1834. The dies were also produced by the same engraver. The two reverse dies have been designated as Reverse X and Reverse Y, following past literature on the subject. Assuming these were minted in 1834 and are thus 175 years ago, that means the coin appreciated 8.731% a year. Not a bad rate of return! 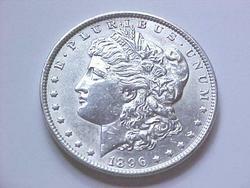 Hopefully, someday my collection of Morgan Silver Dollars and Peace Silver Dollars will be worth something too. Gold and silver are global commodities with spot prices being the same all over the world (assuming you live in an open society). The only differences are the premiums that dealers charge buyers. One of the surprising things has been the large increase in premiums on gold and silver coins. Even though the prices for both metals have dropped from their highs, the cost of buying gold or silver coins hasn’t dropped proportionately. In fact, there’s been reported shortages of these coins by the US Mint and the Australian Perth Mint, not to mention individual retailers. This seems to defy common wisdom; prices drop when demand decreases. Even though spot prices have increased, the demand seems to have increased and thus gold and silver coins aren’t as cheap as they should be. 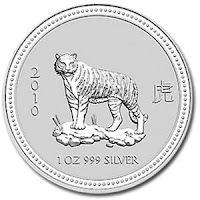 Right now the premium on silver coins is a whopping 60%+. For gold it’s a lot lower but still higher than it’s historic 2.5-3%. I just got an email today from a newsletter service that I subscribe to that’s pretty interesting. I don’t trust my bank. And I don’t trust the dollar. As far as my savings are concerned, I’d rather keep them in gold. And I don’t mean gold futures or gold certificates or gold mining shares. I’m talking about physical gold bullion in a safety deposit box. My family thinks I’m taking a big risk. But as I see it, they’re the ones taking the risk. I’m the one storing my money in the world’s safest asset… the asset that’s been used as money for 5,000 years… and the only money that’s no one else’s liability. Besides, what have I got to lose? My bank pays less than 3% on its savings accounts. I’d advise you to own at least a couple of ounces of gold, too… if nothing else, for insurance purposes. Coins are the best way for individuals to buy gold. They come in small denominations, they’re portable, and you can exchange them for cash anywhere in the world at gold’s international spot price. Here’s the thing: Right now, gold coins are hard to find. Even if you can find them, they’re more expensive than usual. In normal markets, you can buy silver coins below the spot price and gold at a 1% or 2% premium to the spot price. I’ve spoken to at least six gold coin dealers in the last week. Three of them were out of stock. Of the dealers still in stock, the cheapest gold coins I found were selling for a 5% premium to the gold price. In other words, with gold at $800, you’d have to spend at least $840 on a one-ounce coin. The scarcity of silver coins is even worse. One dealer told me he was paying $16 for one-ounce silver coins, purchased in bulk. Right now, the spot price of silver is $9 an ounce. So the premium’s almost 80%. The financial crisis is the reason for this mispricing. Demand for coins, one-ounce bars, and other “retail” denominations of gold has outpaced the ability of fabricators to make them. There is no shortage of physical gold. If you wanted to buy a kilo or a 100-ounce bar, you’d have no problem. The shortage is just a short-term supply problem at the retail level. Gold producers will take advantage of the premium and ramp up production. So in a few months, the big mark-ups will disappear. That said, if you want to buy small quantities of gold right now, go to Canada. The Bank of Nova Scotia is one of the world’s largest precious-metals dealers. If you go to the Hollis Street branch in Halifax, Nova Scotia, or the King Street West branch in Toronto, they’ll sell you Canadian Maple Leaf coins at a 3.7% premium to spot and one-ounce wafers at a 2.6% premium to spot. P.S. Gold doesn’t show up in airport security metal detectors. I’ve tested this with gold coins before. But if you’re traveling across the border with more than $10,000 worth of gold or currency, you must declare it at the border. They’ll run your name and make sure you’re not a money launderer. That’s it. Last Friday, gold dropped to $680/ounce before rebounding to $740/ounce. Like every other asset, gold has been hammered this year. However, this may be partially due to a strengthening of the dollar. In terms of other currencies, it’s still close to its all time highs. I think this is a good time to buy some gold if you don’t already own some. (and if you do, then it’s a good time to add more!). People often ask what’s the best way to invest in gold. I tell them to buy a little bit of everything. Here’s an excerpt of an email I got recently. “I believe the gold juniors offer the best value for your paper dollar going forward,” says Ed Bugos of the violently beaten-down junior mining sector. The Canadian Venture Index, the bellwether of juniors, is down a nauseating 70% from its 2007 high. * Don’t be overly short the stock market at this stage of the collapse. * Don’t slow down your gold buying just because the market is down. Buy a lot of gold – coins and bars. Buy as much as you can before it breaks through $1,000. Then hide it. * Don’t buy the GLD streetTRACKS, unless you’re just trading. * Don’t buy gold from your bank. * Don’t put all your eggs in one basket. Diversify your wealth between tangible assets, like gold, silver and platinum, or even real estate, and continue selectively accumulating bargains in the equity sphere. Diversify geographically. * Don’t invest more than 20% of your wealth in junior miners. It is not a safe-haven panacea. The rewards are potentially high, but the risks are, too. * Don’t keep all your wealth in gold, because the government will one day probably come for it. I own a lot of gold and silver coins and also the Market Vectors Gold Miners ETF (GDX). Check out this link to see my favorite gold coins. China just released a 10 Kilo Gold Coin to commemorate the 2008 Olympics that are currently being held in Beijing. 10 kilos of .9999 Fine gold is a staggering 321 ounces, more than 22 pounds and its more than a half foot in diameter! Not only is it the largest gold coin, it’s the rarest as well: Only 29 have been struck for the entire world and all have been sold. This spectacular museum piece is housed in an exotic African Blackwood presentation case, which is crowned with a 35 pound carved stone dragon. The coin is legal tender with a face value of 100,000 Yuan and is Proof struck, which means it has an ultra-high relief, frosted design set against a flawless mirror background. A company in the US is currently selling it for a whopping $1 million! That’s right One Million Dollars!! Considering that it contains 321 ounces, and each ounce sells for $960, that means its worth about $308,000. Charging $1 million for it is a bit too steep a premium, but considering that there are only 29 in existence, I can see the lure of owning something rare appealing to many people. Especially those people with a lot of money and not enough places to spend it! If I had a million bucks to spend on gold, I’d buy the 100 Kilo Canadian Maple Leaf instead. And this coin cotains .99999 pure gold! But since I don’t have a million dollars lying around, I’d rather keep on buying my 200 year old Napoleon 1st French gold coins for under $500 each! I don’t know if the Chinese will be minting any more of these Olympic gold coins, but I’m positive Napoleon 1st is definitely done minting his collection! I already have several of these, and they’re really quite spetacular. I recently mentioned that I made $500 dollars last month from online advertising. Rather than use that money to expand or improve my lifestyle (also knows as “buying crap”), I decided to invest it in something that has intrinsic value. The US Dollar has losing value over the past 2 years. Just today the Dollar index dropped to its lowest recorded value of 77 and I think its going to keep on dropping. Typically precious metals like Gold, Silver and Platinum do well in times of a weak currecny. Why do I think the Dollar will continue to weaken? A country’s currency is an indicator of its economy. If the country has a good balance sheet, positive flow of funds, a good business plan, strong leadership the currency will be strong. Right now the US has none of those qualities. Anyway, I spent the $500 on some silver coins. 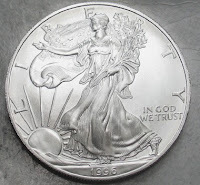 Regular readers already know I like buying gold and silver coins. 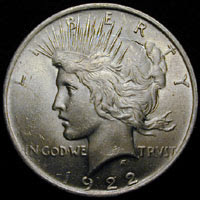 I bought about a dozen each of the perth mint silver tigers, 1920s Peace silver dollars & 2007 silver eagles. They’re beautiful coins, make good gifts and hopefully will continue to appreciate as the Dollar keeps losing value. In part as a marketing exercise, The Royal Canadian Mint has produced a $1 million face value coin containing 100kg of .99999 pure gold. With gold currently trading at $660 per ounce and each kilogram containing 31.1 ounces, the actual cost of the gold in the coin is worth just over $2.5 million USD! It seems to be part of a marketing exercise to promote its .99999 pure gold Maple Leaf bullion coin. Current Maple Leaf gold coins are .9999 pure. In contrast, South African Krugerrands, while containing a full ounce of fine gold, are only .9167 percent pure with the balance made up with copper, so they actually weigh more than an ounce. As most of you know, I’ve been buying a lot of Gold and Silver coins on Ebay. I recently won a bid for a British half-sovereign. Don’t know why, but I didn’t realize that it was a half-sovereign until AFTER I had paid for it via Paypal. I like to collect the regular sovereigns which are quite small to begain with [around the size of a nickel] so the half-sovereigns must be really tiny. Anyway, I sent the seller a email requesting him to cancel the sale and refund my money. Surprizingly he agreed and he didn’t even take me up on my offer to rebate him the listing fees [since it was my mistake]. I got my first Morgan Silver Dollar today. Morgans are beautiful, large and allegedly the most popular collectible coin in the US today. This particular specimen was minted in 1896 making around a 110 years old. Its in pretty good condition for a coin of that age. Considering I only paid $21 for it, I’d say its a great deal too! It has the liberty face on one side and an eagle on the other. Because of the eagles’ somewhat scrawny appearance, they used to be called buzzards! Its called the Morgan after the dude who designed the coin.